One of the world’s most important benchmarks for equity investors is the S&P 500 Index®, a proprietary market-value weighted “basket” of the top stocks that represent about 80% of the U.S. equity markets according to the index owner, S&P Dow Jones Indices/McGraw Hill Financial. Market Clout: There are about US$8 trillion in Assets Under Management benchmarked to the index – companies included in the index have a market-cap of US$6 billion or more (ticker:SPX). More than six years ago the G&A Institute team decided to focus on the companies in the index to determine their level of (or lack of) ESG / Sustainability / CR / Citizenship disclosure and reporting. Our first look-see was for year 2011 corporate reporting activities and after scouring the known sources — each of the corporate websites, IR reports, printed reports, search engines results, connecting with companies and more — we found just about 20% or about 100 of the large-cap index 500 companies were doing “something” along the lines of what we can describe today as structured reporting. There were numerous brochure-type publications that did not qualify as a structured report of value to investors and stakeholders. A good number of the early reporting companies were following the Global Reporting Initiative (GRI) framework for reporting guidance (that was for G3 and G3.1 at the time), and some perhaps had some other form of reporting (such as publishing key ESG performance indicators on their website or in print format for stakeholders); GRI’s G4 was later embraced by the 500. And now we move on to the GRI Standards, which we are tracking for 2018 reporting by the 500. The response to our first survey (we announced the results in spring 2012) was very encouraging and other organizations began to refer to and to help publicize the results for stakeholders. We were pleased that among the organizations recognizing the importance of the work was the GRI; we were invited to be the data partner for the United States, and then the United Kingdom and the Republic of Ireland. That comprehensive work continues and is complementary to the examination of the 500. Looking back, we can see that the research results were early indications of what was going on in the corporate and investment communities, as more asset owners and managers were adopting ESG / sustainability approaches, investment policies, engagement programs — and urging more public company managements to get going on expanded disclosure beyond the usual mandated financials (the “tangibles” of that day). Turns out that we were at an important tipping point in corporate disclosure. Investor expectations were important considerations for C-suite and board, and there was peer pressure as well within industries and sectors, as the big bold names in Corporate America looked left and right and saw other firms moving ahead with their enhanced disclosure practices. And there was pressure from the purchasing side – key customers were asking their corporate supply chain partners for information about their ESG policies and practices, and for reports on same. There was an exponential effect; companies within the 500 were, in fact, asking each other for such reports on their progress! We created a number of unique resources and tools to help guide the annual research effort. Seeing the characteristics and best practices of sustainability reporting by America’s largest and for the most part best-known companies we constantly expanded our “Sustainability Big Data” resources and made the decision to closely track S&P 500 companies’ public reporting — and feed the rich resulting data yield into our databases and widely share top-line results (our “Flash Report”). Note that there are minor annual adjustments in the composition of the S&P 500 Index by the owners, and we account for this in our research, moving companies in and out of the research effort as needed. Louis Coppola, EVP of G&A Institute who designs and manages the analysis, notes: “Entering 2018, just 15% of the S&P 500 declined to publish sustainability reports. 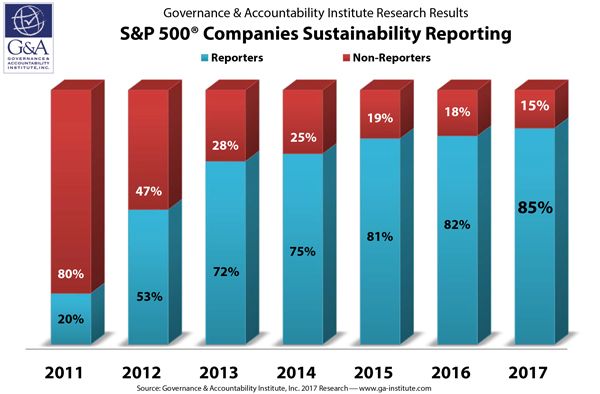 The practice of sustainability reporting by the super-majority of the 500 companies is holding steady with minor increases year after year. One of the most powerful driving forces behind the rise in reporting is an increasing demand from all categories of investors for material, relevant, comparable, accurate and actionable ESG disclosure from companies they invest in, or might consider for their portfolio. Does embracing corporate sustainability in any way impact negatively on the market performance of these large companies? Well, we should point out that the annual return for the SPX was 22% through 12-13-18. You can read more in our Flash Report here. Thank you to our wonderful analyst team members who over the years have participated in this exhaustive search and databasing effort. We begin our thank you’s to Dr. Michelle Thompson, D.Env, now a postdoc fellow supporting the U.S. Department of Energy in the Office of Energy Policy Systems Analysis; and her colleague, Natalia Valencia, who is now Senior Research Analyst at LAVCA (Latin American Venture Capital Association). Their early work was a foundational firming up of the years of research to follow. Kudos to our G&A Research Team for their significant contributions to this year’s research report: Team Leader Elizabeth Peterson; analyst-interns Amanda Hoster, Matthew Novak, Yangshengling “UB” Qui, Sara Rossner, Shraddha Sawant, Alan Stautz, Laura Malo Yague, and Qier “Cher” Zue. We include here a hearty shout out to the outstanding analyst-interns who have made great contributions to these research efforts in each year since the start of the first project back in 2011-2012. It’s wonderful working with all of these future leaders! Footnote: As we examine 1,500 corporate and institutional reports each year we see a variety of titles applied: Corporate Sustainability; Corporate Social Responsibility; Corporate Responsibility; Corporate Citizenship (one of the older titles still used by GE and other firms); Corporate Stewardship; Environmental Sustainability…and more! If you would like to have information about G&A Institute research efforts, please connect with us via our website.